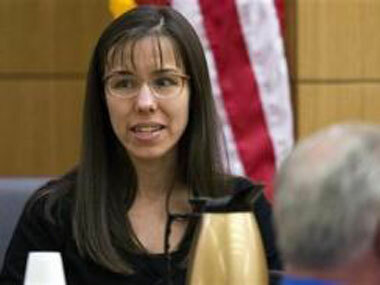 How is it that no one I've asked is watching this Jodi Arias trial? CNN's sister station, or whatever they refer to it as..., HLN covers it just about 24/7. Not only do they show live coverage of the trial during the day, but shows like "Nancy Grace" and "Dr. Drew" cover it every weekday night. Jodi is on trial for murdering her boyfriend, Travis Alexander, by stabbing him something like 29 times, and shooting him in the face. She's told about a million lies about it- First saying she wasn't even at his house when it happened. Then she changed her story and said 2 intruders attacked him but spared her. Then, finally, once she knew they had loads of hard evidence against her, she said that yes, she did it. But it was self defense. I have been glued to HLN for a couple of months now. The best part about this trial, and what makes it so interesting to watch is Jodi took the stand beginning about 2 weeks ago. Both the prosecution and the defense have asked all their questions, and made their cases. Starting today, the judge is asking Jodi over 100 questions that the have jurors submitted. How cool is that? This trial is far more entertaining than anything else I've seen on t.v. lately. Or maybe ever. I've never even heard of this?! I don't usually watch CNN or HLN, but you'd think I would've heard about it at some point. You'll have to keep me posted on the verdict, just in case I don't hear about that either. Craziness! I am sure that they will make a fantastic thriller movie out of the case of Jodi. She has done something unbelievable and has stood as a bad example. Such people should be punished strictly.